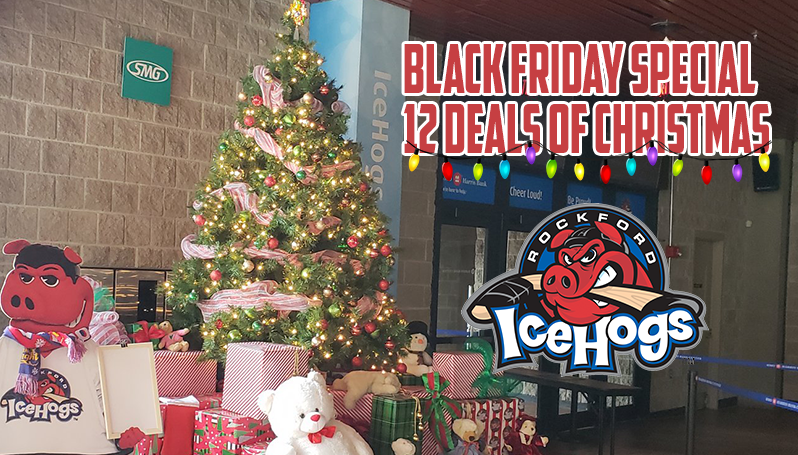 ROCKFORD, Ill. – The Rockford IceHogs are kicking off their second annual “12 Deals of Christmas” promotion with a Black Friday ticket special, which will be available beginning at 12:01 a.m. on Friday, Nov. 23. Fans can purchase upper-level tickets to that evening’s Hockey Fights Cancer Game for just $5 from 12:01 a.m. to 10 a.m. on Friday. After 10 a.m., tickets will be available for $10 throughout the remainder of the day leading up to puck drop between the IceHogs and Chicago Wolves at 7 p.m. at the BMO Harris Bank Center. Fans can take advantage of this Black Friday deal by ordering online at icehogs.com (or by clicking HERE). In addition, beginning at 9 a.m. on Friday, tickets will also be available for purchase in-person at the BMO Harris Bank Center Box Office or by calling the IceHogs at (815) 968-5222. (Please note, each online ticket purchase will include a $2 service fee). Following Friday’s Black Friday’s ticket special, the IceHogs will continue their “12 Deals of Christmas” promotion by announcing a special deal or discount at 10 a.m. each weekday until Monday Dec. 10. The promotions will be revealed once per day over the next 12 weekdays to give fans a unique opportunity to take advantage of special discounts on IceHogs tickets, merchandise and food and beverage options at the BMO Harris Bank Center. Once announced, offers are valid until the conclusion of that calendar day. Fans are encouraged to visit icehogs.com daily to view the current available deal. The IceHogs will update the “12 Deals of Christmas” webpage each weekday at 10 a.m. with a new promotion, and also announce each special offer on their social media platforms.